A two-storey loghouse for max. 6 people. Wonderful opportunity for a smallish group or family who appreciate privacy and a holiday close to the nature. A good opportunity for bird watching: the centre of Vilsandi Nature Park is located ca. 1 km away in Loona Manor, watchtowers are only a few kms away by the sea, possibility to visit the nearby Vilsandi island, hiking routes in the nature park start ca. 500 m away, etc. 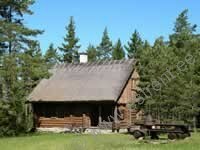 The cabin has an open kitchen (wood-burning stove), living room, WC, possibility to wash in the sauna (old estonian style). Two separate bedrooms upstairs. Both bedrooms are furnished with a broad double bed (altogether beds for 4 people). Possibility of a simple bed for a child in one of the bedrooms. 2 additional beds on the couch/bed in the living room (included in the price). Water from a tap, hot water from a boiler, drinking water from the shop, if required (Kihelkonna – 2 kms). Lighting with battery 12V and electricity with a generator 220V.